The Physical Foundation of Biology: An Analytical Study offers a detailed account of the relationship between physics and biology. The discussion is based on a threefold development in theoretical science: the theory of automata (often designated as computers); the theory of information (mainly developed in communication engineering); and the theory of microscopic measurement in the atomic and molecular domain (based largely on quantum mechanics). 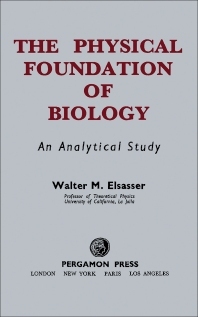 This book is comprised of five chapters and begins with an overview of the physical foundation of biology, paying particular attention to preformationism and the theory of epigenesis. The first chapter explores feedback and control by comparing the control apparatus of a more differentiated organism, the nervous system, with the corresponding achievements of electronic engineering. The reader is then introduced to the theory of information, focusing on the idea that certain quantitative aspects of the information content of messages can be separated from the specific physical features of the device sending the message. The following chapters deal with the importance of storage or memory devices for a complex functional mechanism; the compatibility of biotonic laws with the ordinary laws of physics; and physical interpretation of the theory of microscopic processes. This monograph will be of interest to physicists, biologists, and chemists.